The Tirfor TU Range includes 3 heavy duty, quality machines for lifting and pulling applications. The Tirfor TU Range contains three models with different working load capacities. They are a heavy duty machine and therefore well suited to most heavy duty lifting and pulling applications. 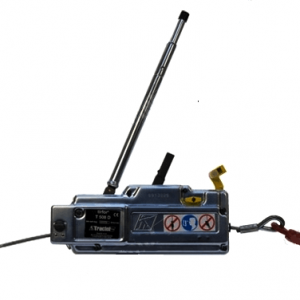 The Tirfor Winch TU range incorporates the TU8, TU16 & the TU32 with lifting capacities at 800kg, 1600kg and 3200kg respectively and are all available from Lifting Hoists Direct. 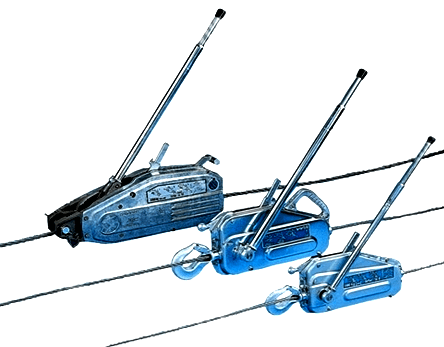 The Tirfor TU winches are easy to transport and use for many different tasks which include lifting, puling, guying, tensioning and lowering loads. The versatility of the Tirfor TU range makes them an ideal piece of equipment to keep in your work/site vehicle. The self-energising jaws on these Tirfor winches exert an excellent grip on the wire rope, it is also proportional to the load, meaning that when the load is heavier – the jaws grip more firmly. The Tirfor TU is easily attached to a suitable anchor point with its hook or anchor pin (depending on model), they are then operated via the two handles or levers. One for forward and one for reverse. Also included is a telescopic handle which fits easily onto both levers to facilitate easier push & pull movements to operate the jaws giving continual movement. The Tirfor TU8 & the Tirfor TU16 come with a hook with safety catch for easy anchoring. You should always ensure the safety catch fully closes to ensure total safety. 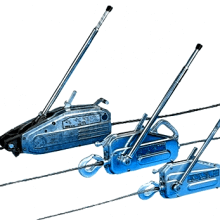 The Tirfor TU32 has an anchor pin and is secured slightly differently to the TU8 & TU16. The spring clip should be opened and then removed from the anchor pin sliding it out from the side cases. Fit the sling or other anchoring arrangement between the side cases then re-insert the anchor pin, guiding through the sides and sling as you go. Next, re-fit the spring clip to the pin and close. Ensure it is fitted correctly so it cannot fall out. 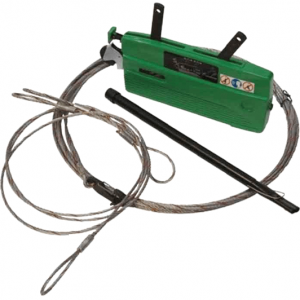 Each winch comes with safety shear pins, which can be replaced if they shear off. Each model carries replacement pins, these can be located in the operating levers on the Tirfor TU8 & Tirfor TU16 and in the rope release lever in the Tirfor TU32. To replace the cotter pins, first you will need to remove the sheared ones. These can usually be tapped out with a suitable punch (the TU8 & tu16 may need the forward lever stub removing using an extractor). After removal of old pins, re-fit handle, aligning the grooves. Once the holes are aligned you can tap the new pins in place with a hammer. On the Tirfor TU32 you need to align the holes of the upper and lower sections of the forward lever. You should ALWAYS use genuine shear pins and never other brands as they can cause failure of the machine. You should always use a sling for load attachment, NEVER use the wire rope to wrap around the load and hook back on its self, this is a dangerous procedure. We recommend wearing suitable, protective gloves when handling wire rope. 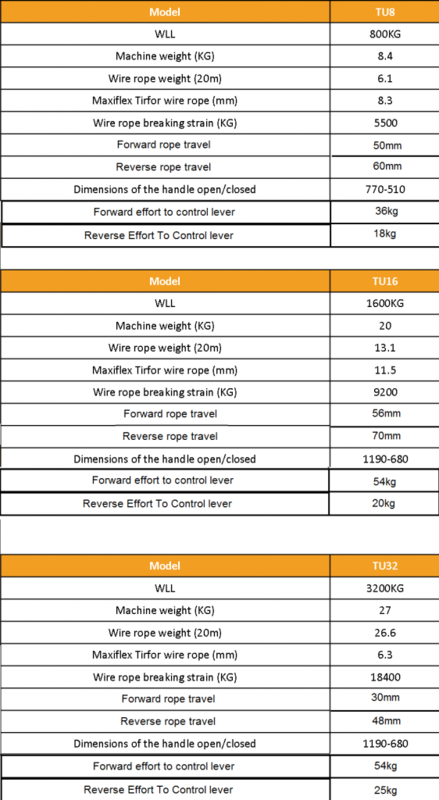 You should only use the correct ‘Tirfor’ wire rope for these machines to guarantee safety, they have been designed and tested to work specifically with these winches. 20 metres of wire rope is included as standard with all Tirfor TU models they have different diameters according to the size of the model chosen. Each end of the wire rope is finished differently, one end is fuse and tapered to enable easy threading into the device. The other end will have a specific end fitting which is usually a safety hook on a thimble, though other options may be available. It is highly important to visually inspect the wire rope before each use to determine if there are any defects which could impair the safety of the rope. Never use the rope if you observe kinks, bends, broken wires or hard worn areas. It is also worth noting that when long lengths of wire rope are used for lifting purposes, necessary steps must be taken to stop the load from twisting/rotating as this can cause the rope to unravel / untwist on itself which can have severe consequences. Lay out the rope, ensuring there are no kinks etc. Release the jaws by pressing the rope release safety catch and lift the rope release lever until it locks into position. The internal jaw mechanism has now been released and is ready to accept the wire rope. At the opposite end to the anchor point there is a rope guide. Proceed to push the fuse and tapered end through the guide. If necessary you can use the forward operating lever to help. When the rope protrudes from the anchor point end you can pull it through to the desired position, removing all slack. The Jaws now need to be re-engaged. To do this, lift the rope release lever slightly, then press on the rope release safety catch. Maintain pressure whilst the release lever goes back to its starting point. Release the safety catch and the lever will lock into place. Your TU winch is now ready to use. These winches are easy to maintain, they should be kept clean and be lubricated at regular intervals. Always use the recommended lubricant, never grease or oil containing graphite additives or molybdenum disulphide. SAE 90-120 oil is recommended, this should be applied to the internal mechanisms through the operating lever openings and special lubrication holes operate both levers to ensure all parts are fully lubricated. Forward lever operates freely BUT does not operate jaws. The machine has probably been subjected to overload and the safety pins have sheared; replacing the safety pins should rectify the issue. Pumping – an inconvenience where one jaw locks and machine travel is minimal; the solution is to re-lubricate the machine. Sometimes a damaged section of wire rope will block up the jaws, when this happens, you should stop using the winch, remove the load or transfer load to another device or another means; When the load is removed from the blocked machine you should be able to release the jaws and remove the wire rope which should be discarded. If you can’t remove the damaged rope then take it to an approved repairer.